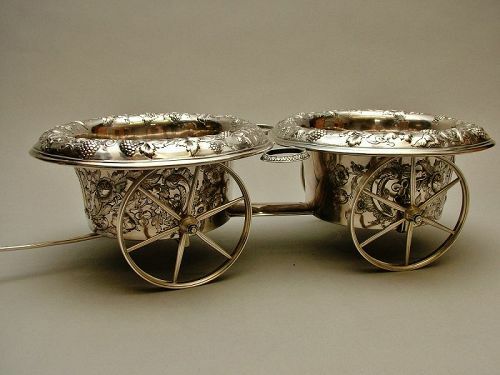 Though we won't be so bold as to claim that it is unique, American silver wine trolleys from the mid 19th century are most certainly scarce. Known for his ecclesiastical silver, Cooper's work can be found in major museums, notably an enameled chalice and paten in Boston's Museum of Fine Arts (accession number 1996.27.1-2), and a flagon in the Newark museum. This piece, with its whimsical and amusant prairie schooner form, would make a splendid and functional addition to any dining table.